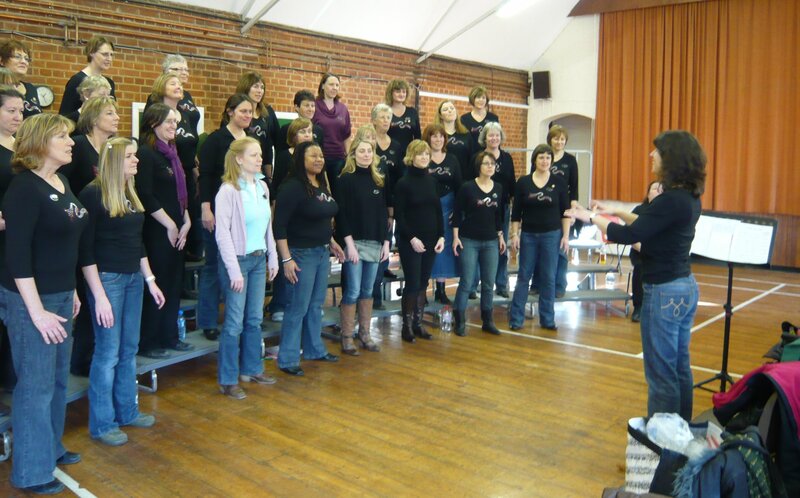 I spent a happy four hours with Amersham A Cappella yesterday afternoon. They invited me down not only to coach the chorus, but also to work with Helen, their director, and Rose, assistant director, on conducting technique. It takes a certain amount of courage for directors to put themselves on the line like that in front of their singers, and it is a testament to the spirit of trust and mutual support within the chorus that their directors felt willing to do so. When a director changes an element of their technique at the suggestion of a coach, it will usually feel really strange to them, and it may feel as if it is making their job harder rather than easier. However, if they can get immediate feedback on the difference it makes to the results they can get with their chorus, they will be able adapt to it – indeed, embrace it – much more quickly. This feedback comes in two forms: first, what the music sounds like with the changed technique, and second, what the chorus say about it. For instance, we worked with Rose on standing more upright rather than moving with the music – giving the singers less of a moving target. There was an immediate increase in the depth and resonance of the sound that she elicited, and the chorus said afterwards they felt more confident when she stood like that. Yes, you can get this kind of feedback from a project choir at a training event (and very helpful it is too), but when the responses are from the group of singers you are most accustomed to working with, there is a much more immediate and motivating impact. Many directors have had the experience of going to a training event, changing some element of their technique, and coming home to have their singers actively resist the change. Choirs and directors all develop habitual patterns of behaviour in response to each other, and sometimes these are helpful or benign, and sometimes they are not. ‘But we love you the way you are,’ is heart-warming in some ways, but it can also become an obstacle to development. Working with director and chorus together gives the chance to address these kinds of co-dependencies. For instance, Helen had some time ago engaged in the good practice of not mouthing the words to the singers, but had been inveigled by them into starting again. Amersham A Cappella are far too good a group to claim that they needed the mouthing to remember the words: rather they couched their need in terms of response to Helen’s expressiveness. Nonetheless, when Helen stopped mouthing the words again, some of them started noticing how expressive her hands are. And now, if she really wants to draw attention to a particular word or line, the chorus will really notice what she does with her mouth, because it’s no longer part of the background activity of directing. Still, it took some negotiation with the chorus to reconcile them with the change. Like all human beings, they like being comfortable, and a director focused on the needs of their singers can find themselves responding to what the chorus wants to keep them happy, rather than on what the music needs. The flip-side of this kind of co-dependent relationship is that the chorus is a great resource to enrol to help the director develop. We did some simple exercises whereby Helen would direct the chorus to sing a single chord, listen to it until she was happy with it, then stop them – and repeat two or three times. This gave her the chance to adjust her gestures in response to what she was hearing, and the chorus the chance to listen carefully and empathise with what she was listening for. An awful lot of nuanced work on balance, fine-tuning, tone and vowel matching went on in those chords, all effected intuitively by the empathic bond between director and singers. And the singers can help in more pro-active ways, too. We talked about the difference between musical (or expressive) gestures and didactic (instructional) gestures (more on these in my forthcoming book). Helen has a very clear distinction in her directing as to where these are placed: musical gestures are lower and closer to the body, whereas she lifts her hands up and forward when she’s giving a ‘do this!’ gesture. The decision all directors have to make is how long to keep making a didactic gesture as a reminder to do something. So, I suggested that the singers can help in this diagnosis: if they see a didactic gesture for something that they weren’t going to forget to do, they can drop Helen a hint, and she can keep her hands back in the ‘musical zone’ for that part of the song. The value of this is twofold. First, it maximises the time Helen spends being expressive rather than managerial, which will help the musicianship and richness of the performance. Second, it frees her hands up so that if she needs to make a new didactic gesture in response to the needs of the moment – to adjust balance, or control tempo, for instance – she can draw the singers’ attention to it by moving back into the ‘instructional zone’ to make the point. They in turn will notice this more readily because she was not already gesturing there.